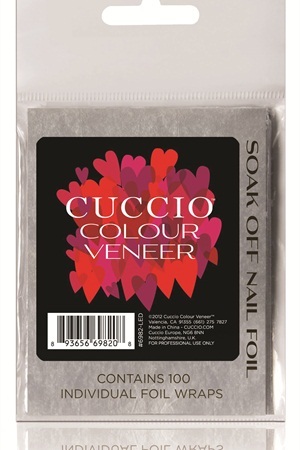 Cuccio has new specially made soak-off foils to go with its line of Cuccio Colour Veneer Gel-Polish. The individual foil wraps fit snugly over fingers and toes and keep acetone or remover product tightly adhered to the nails with no slipping or leaking. Each packet contains 100 individual foil wraps, and they are pre-cut to a suitable size for any finger or toe. Simply saturate a cotton ball or gauze with acetone or remover, place onto the nail, and then secure it with the Cuccio Colour Veneer Foil to create a tight bond that will quickly remove gel-polish.